Sometime it happen that we found our self in a tough situation when you we accidentally deleted your images, Videos ,Documents and other data accidentally ? 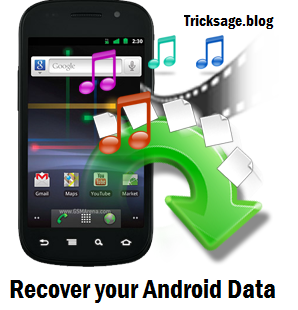 or we format our SD card due to virus or by mistake and to solve this problem Tricksage.blog is providing a solution to all by posting this article and with this you can recover your important file back or your special songs collection that you have erased but this trick or solution has restriction that :- YOU MUST HAVE A ROOTED ANDROID! and if dont have a rooted android phone then you root by Clicking here. Well this solution not that big but it just an Apps(Hexamob Recovery Pro 2.1) but this app is not free that why we are providing you this app and this surely help to recover all android data you erased. - You can use this application like an undelete / unformat tool (tested with and formatted “sdcard”). - Support FAT (vfat) filesystem type ( “sdcard” or partition from internal memory must be formatted with this ). - Search for any file type or select types from filters. - Deleted files long ago will be more difficult to recover because some blocks of file can be overwritten. - Recovered files are stored in recovered folder of your device(usually in the “microSD” although some devices can create this folder on the internal storage). - This application need “Superuser” permissions. Download Android Recovery App for free. if you like our blog articles then you can join us on social network and get latest update such tricks.